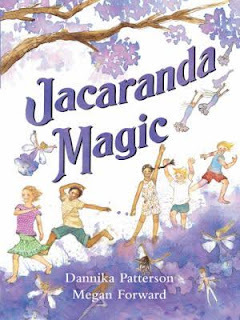 Jacaranda Magic is a picture book that delightfully captures the beauty of imaginative play and the enchantment that nature so brilliantly provides. The tale begins with five young friends sitting under a jacaranda tree pondering what to do. They are stuck for ideas until nature beautifully intervenes. The children’s imaginations are soon ignited when a cool breeze causes the purple bell-shaped blooms to rain upon them. The small flowers transform into a variety of props including genies, butterflies and asteroids. The large tree branches become abodes, vehicles and vessels for their lively outdoor adventures. Jacaranda Magic is beautifully written in verse and accompanied by gorgeous soft pencil and watercolour illustrations, predominately in double-page spreads. This playful picture book is likely to engage children aged 4-6 years old. It would be equally suitable for the early years’ classroom or read as a bedtime story at home. This tale would sing to the heart of any early childhood educator. Let’s hope that the magic of open-ended imaginative play is never lost.